Besides the Oscar-winning animated short film Feast, one of the animated shorts that was making a whole lot of buzz during awards season was called The Dam Keeper. Here’s the description from Wikipedia: ” It tells the story of Pig, an introverted youth who lives in a windmill and keeps a dark fog from engulfing his town. Although socially rejected by his peers, he is befriended by the artistic Fox.” The Dam Keeper was directed by Robert Kondo and Daisuke Tsutsumi, both art directors at Pixar (they worked together on Monsters University). Now comes this bit of news from Cartoon Brew: “Tonko House, the studio founded by former Pixar art directors Robert Kondo and Daisuke “Dice” Tsutsumi, is developing a feature film based on their Academy Award-nominated short The Dam Keeper. The announcement was made along with the news that Tonko House is partnering with First Second Books, an imprint of Macmillan, to expand their short into a graphic novel series. 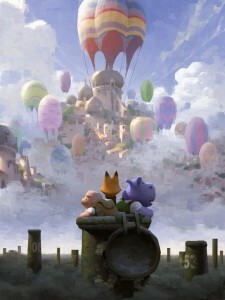 The first book in The Dam Keeper graphic novel series will be released in 2016, picking up the narrative some years after the original story of the orphaned Pig and his quest to maintain the town dam. It will address two questions unanswered in the film: what happened to Pig’s parents, and how did his world come to be at the mercy of a dark cloud? ” No more details yet about a release date for the feature film, but the animation community will be watching closely.